Very nice shot Louis. The process seems so subtle in this shot. lol. Love the “Totally Awesome” part. Hi Louis, nice to discover your site! Great photo, it really interested us because we would not see this in the UK. My reaction was – how cool it looks like something out of a 1950s B movie, and my son really felt it was wrong – (not the photo, the attaraction)- he says ‘it’s like someone in space is looking at down at us on our planet and saying ” Look what they do for entertainment – they point at freaks and laugh at them!”. So your pic is a social commentary as well! Well of course it is. I agree with you, looks like a 1950’s movie still. Evidently, it was a pretty popular attraction. Maybe it was the $1.00 admission fee…lol. 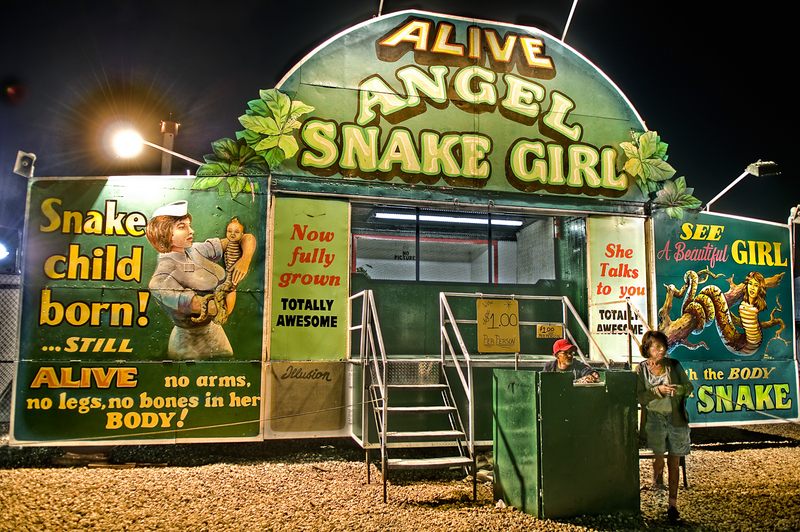 All I know is this image and “Angel Snake Girl” seems to be Googled a lot. Thanks for dropping in and come back anytime. Awesome work! Never saw such an attraction. There must be something from the fairs of 17th century in it. P.S. Thanks from stopping by at my photoblog. Appreciate your kind comments!